Responsa is a tool for adding interactive FAQs (frequently asked questions) to your company website through an embedded widget. That sounded more like a feature than a business to me — after all, help desk applications like Zendesk and GetSatisfaction already have knowledge management systems for handling FAQs. But founder and CEO Gabriele Antoniazzi says that not everyone needs such a complex a solution — and users were actually asking him for the service before it was ever even built. “I really liked the user experience of Quora, but not everyone in Italy spoke the language,” Antoniazzi says. Ultimately though the site didn’t get the level of participation Antoniazzi wanted, but he says people kept contacting him asking if they could provide a white label version of the platform to be used by other companies. Antoniazzi thought about it, but thought that building a white label solution was too complex. “There had to be a better way,” he says. So he decided to pivot the company and build an embeddable Q&A widget. 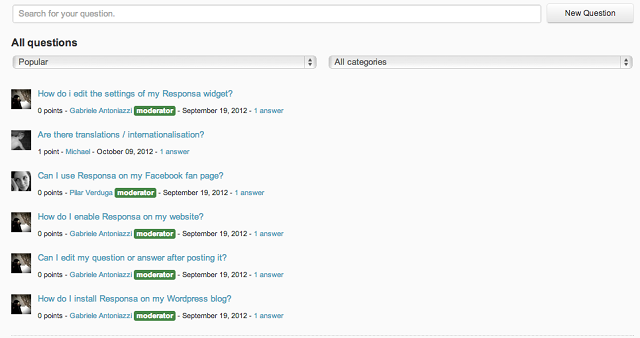 The free version allows for one moderator and up to 100 questions per month. Paid plans add more moderators, allow for more questions and add a few more features such as the option to create a private community. Although there were already companies asking for it, it does seem like Responsa would be more useful if it were connected to a help desk system. Antoniazzi says the company is looking into integrating with various help desk systems. Personally I think it would interesting to see Responsa get involved in Networked Help Desk, an API standard designed to make it easier to connect various customer support related tools, including help desk, customer relationship management and bug tracking applications. Responsa has also decided to focus, at least initially, on companies’ official websites, not on social media. Antoniazzi says this is because Responda wants to help companies build engagement on their own sites. He also points out that even though there are many people interacting with companies through social media, a company’s official website should still be the most authoritative place for information about that company.